I ended up making the braces slightly different from the drawing. There, I drew the braces notched to rest on the stretchers. However, as a practical matter, getting those notches right is tricky. So instead I left the braces intact, and notched the stretchers. After showing that, I'll go over how you might approach notching the braces as shown in the drawing if you prefer that way. 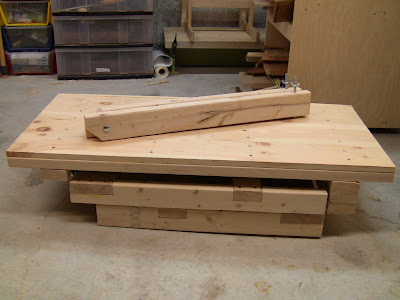 Either way should work fine, because it's the shape of the triangle between top, legs, and braces that gives the bench rigidity, pinned in place by the leg hinges and bolts through the pivot block and stretchers. The fit of the notches don't really affect it. But the key consideration here is that you custom fit the braces to the assembly you ended up with. To fit and attach the braces, attach them to the pivot block under the top. Swing them to their position at the leg stretchers and mark for the notches. Saw and chisel out the notches similar to the way you made the leg laps, then bolt the legs to the stretchers and trim everything up. The bolts are removable, with wing nuts, for easy disassembly. Cut a piece of 2x4 scrap 6" long for the block. Mark a corner at each end of one edge at 45 degrees with the combination square, leaving 1" of width at the square corners. With the bench upside down, find the center of the space between the legs and the center of the top front to back. Position the pivot block centered on these points, straight edge down. 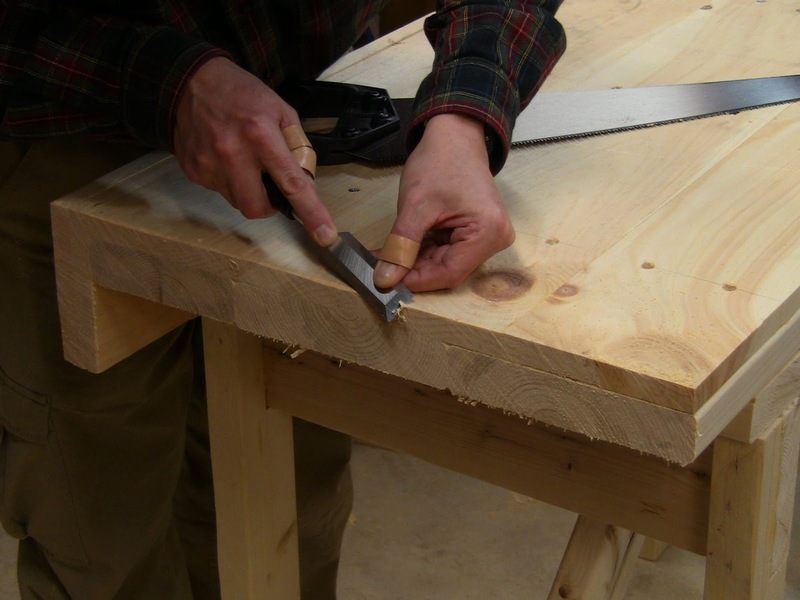 Holding the block down firmly, drill 15/64" pilot holes through the notched corners into the bottom side of the top. 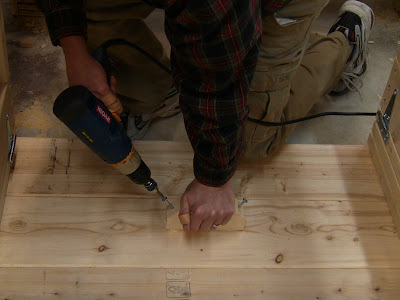 Since long screws will be going in them, remove the block and deepen the holes without going all the way through. Glue the pivot block down. Drive #14x4" screws in the pilot holes. These are big screws, so go slowly to avoid stripping the heads with the driver bit. With the block held in place, drill pilot holes in the notched corners. 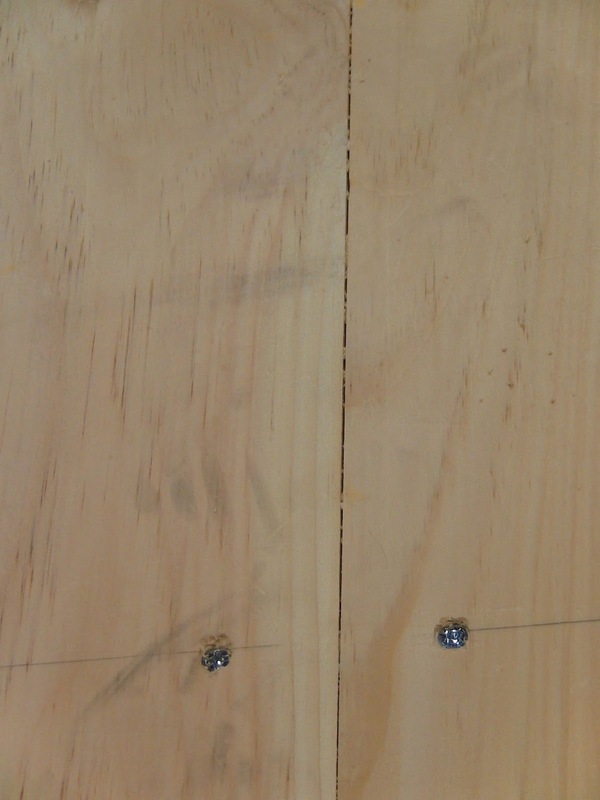 After applying glue, drive #14x4" screws in, securing the block to the bottom side of the top. 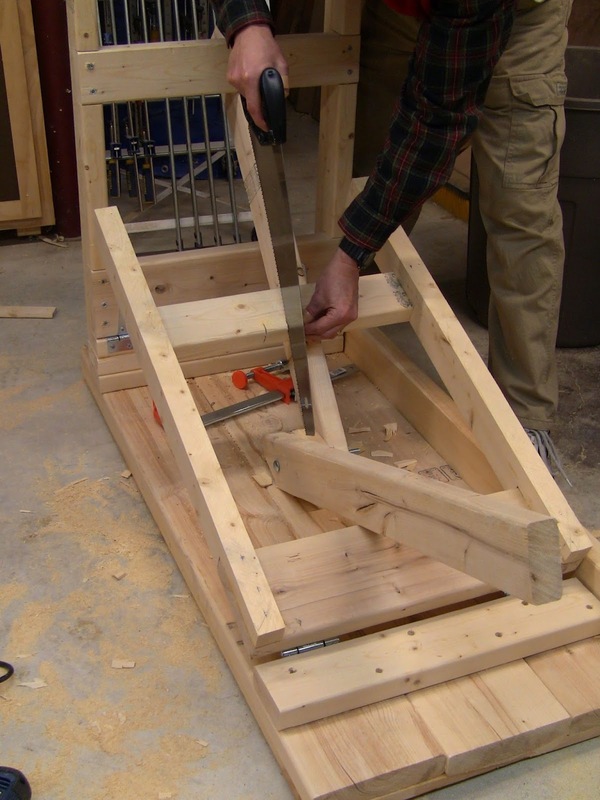 Set the straightedge at the block to see where it contacts the upper side of the stretcher. Add 3" to this length. Cut one brace to the resulting length. Mark it as left or right (when facing from front of upright bench). Each brace will be independently fitted, so you don't want to mix them up. Repeat steps 1 and 2 for the other brace. 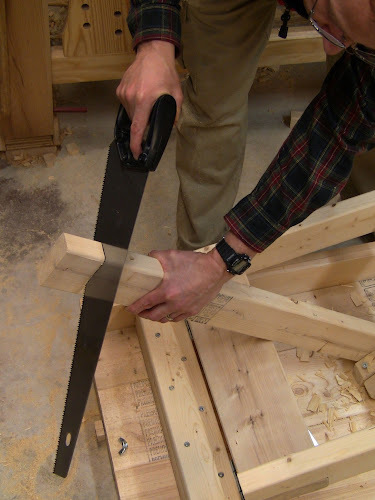 Alternatively, you can simply cut an 8' 2x4 in half to trim to size once the brace is attached. 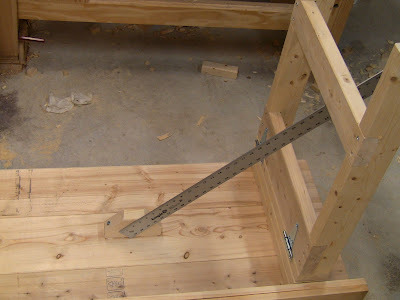 Measure from pivot block to 3" past the stretcher for rough length of the brace. 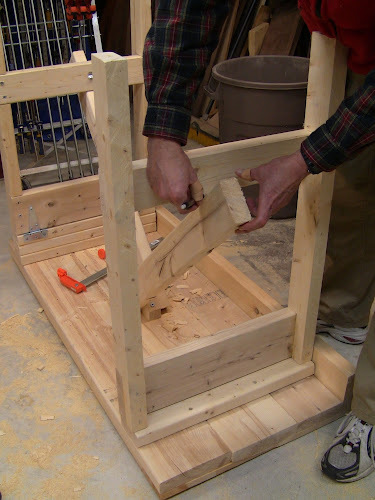 Mark a 45 degree angle to knock off a corner of a brace using the combination square. Clamp the brace in place against the near side of the block, notched corner down. 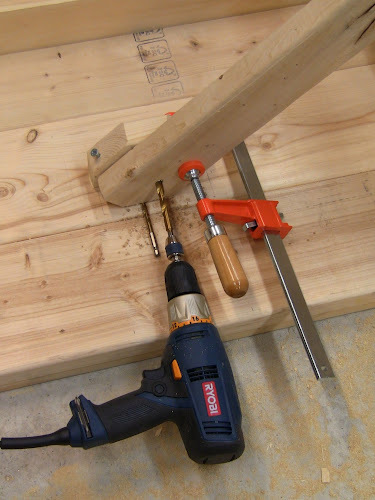 Use a 1/4" drill bit as a spacer to keep it away from the bottom side of the top. That prevents jamming up later when reassembling things. Drill a 3/8" hole through the brace and block. 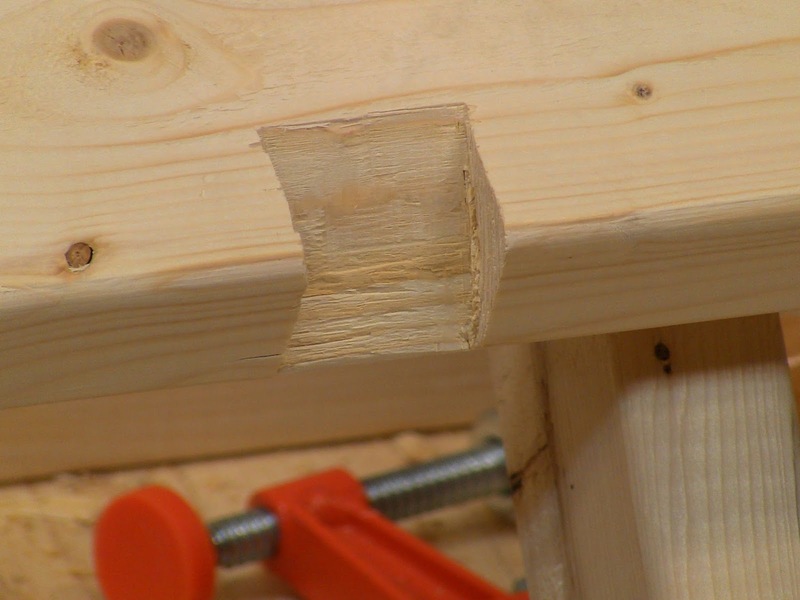 Once the hole is started in the block, you can remove the brace and finish drilling through the block, keeping the exact position and angle. 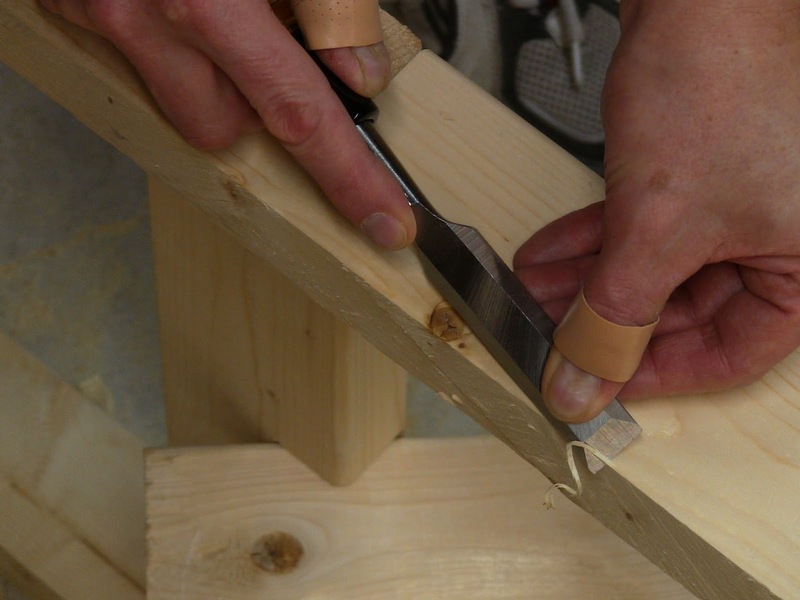 Repeat steps 1-4 on the other brace, except that you'll clamp it to the far side of the block, then use the hole in the block as a guide to drill the hole in the brace. Put both braces in place and run a 3/8"x6" bolt through the holes. 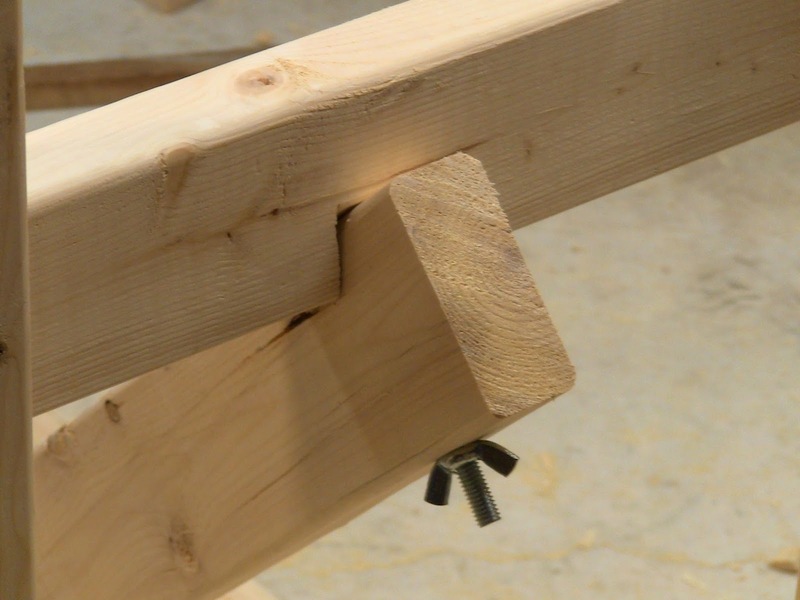 Spin a wing nut down the end of the bolt until it's finger tight and the braces are snugged up against the block. Mark a 45 degree angle on the end of the brace. Saw this corner off. The leg makes a convenient clamp support to hold the brace. 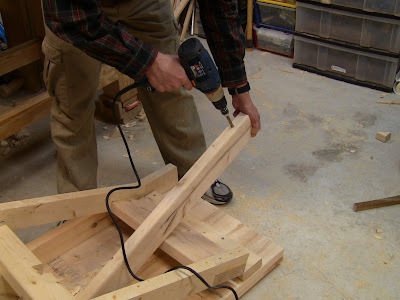 With the brace clamped to the near side of the block in its position against the stretcher and a 1/4" drill bit under it as a spacer, drill through the brace and block. 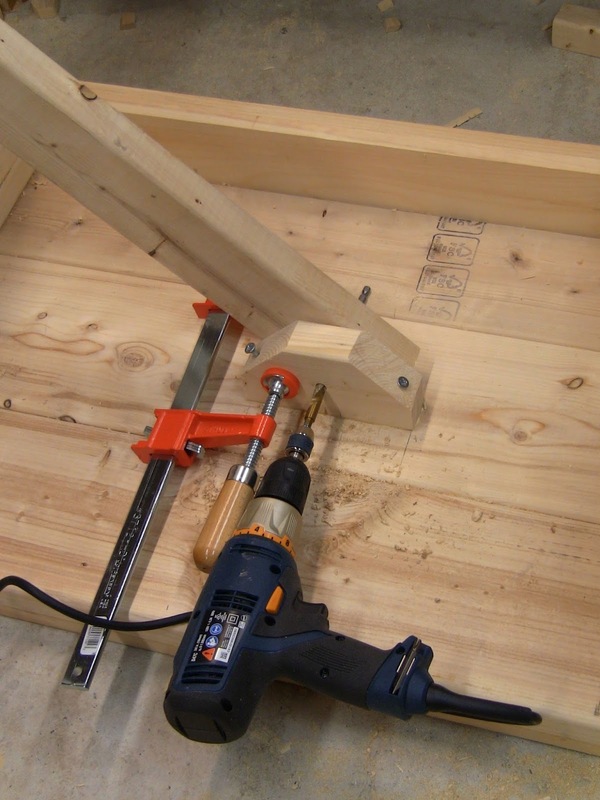 With the other brace clamped to the far side of the block, use the hole in the block as a guide to drill through the brace. 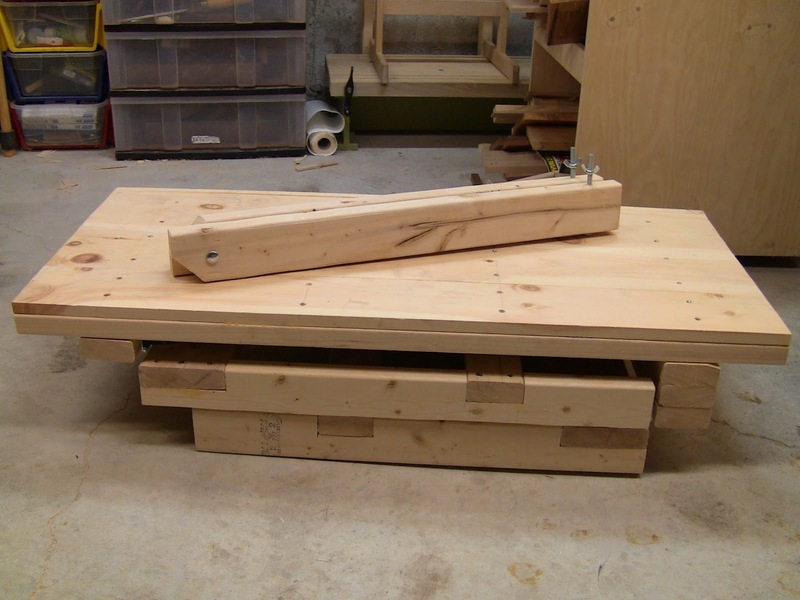 Raise a brace up against its stretcher. Mark where the brace contacts the corner of the stretcher on each side. 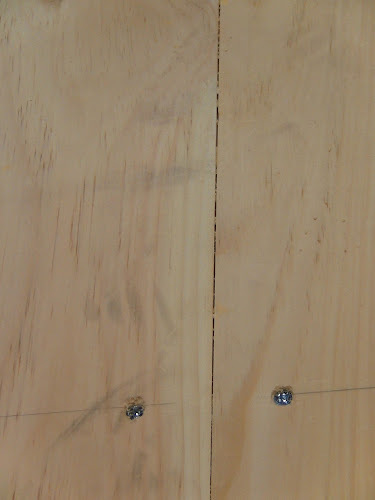 Saw partially down the corner of the stretcher at each of these marks, angled down the outer face of the stretcher. Make an additional center relief cut between them. Chisel out the waste along this sloping angle. Don't worry about cleaning up yet. 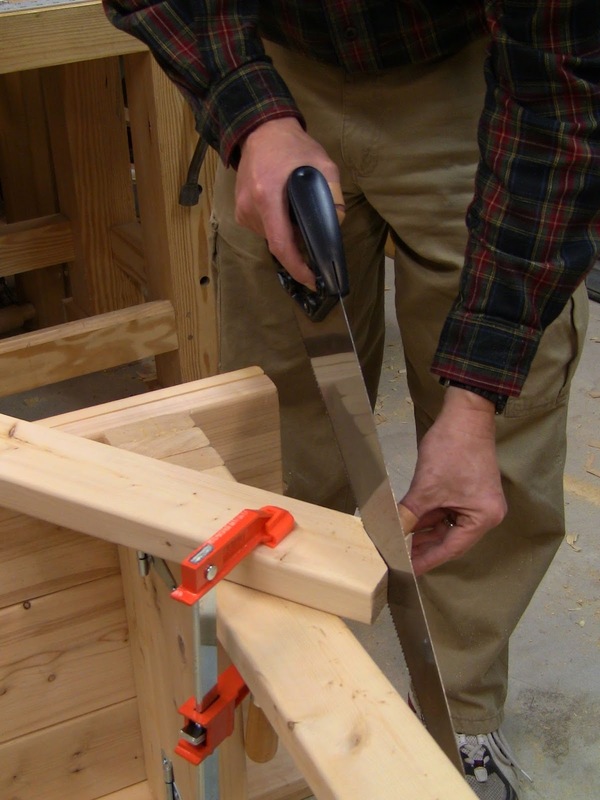 Bring the brace and stretcher together again and see how the brace rests in the notch. Most likely the notch will need to extend further down the stretcher face to seat well. Saw the notch down further as necessary, chisel it out, and test the fit. Do this is in a couple of small steps to avoid taking too much out. This is custom fitting, so don't rush it. Stop when it's a reasonable fit. Pare the sloped face of the notch smooth. With the leg upright in its final position, hold the brace up in its notch and drill a 3/8" hole through the stretcher and brace, at 90 degrees to the brace. 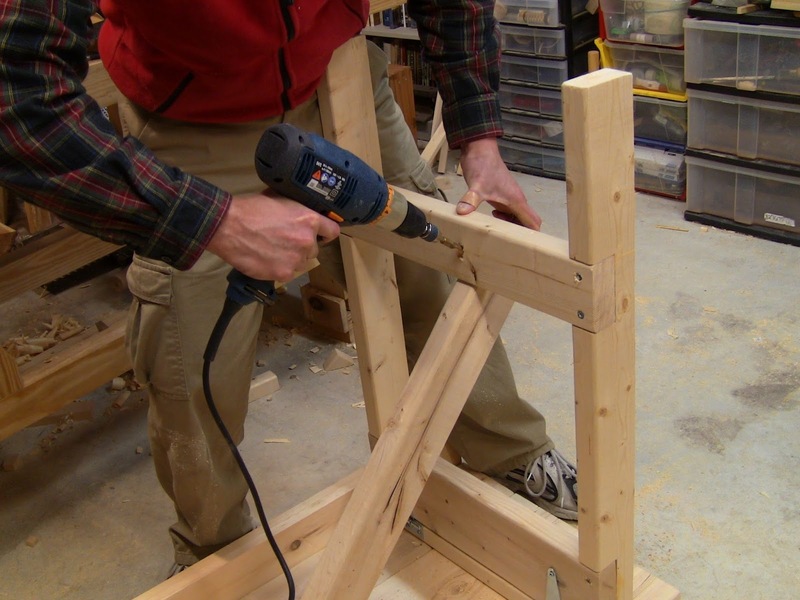 Once the hole is started in the brace, drop it down to finish drilling through. 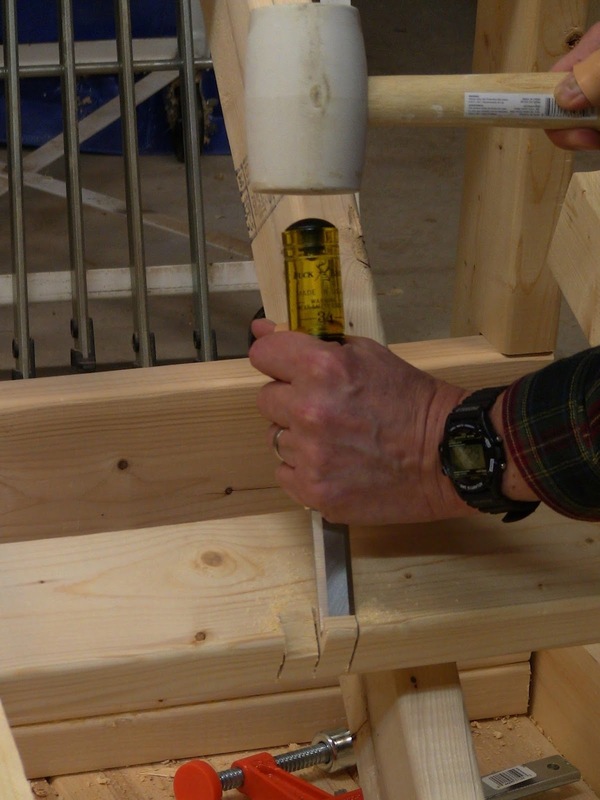 Chisel a clearance space around one side of the stretcher hole so the head of the bolt will snug down into it. Run a 3/8"x6" bolt through the stretcher and brace, then put a wing nut on the end and spin it down tight. Repeat steps 1-9 for the other brace. Raise the brace up to the stretcher and mark where each side contacts. Saw out shallow cuts across the corner at these marks, then make an additional matching relief cut between them. Chisel out the waste in the angled notch. After a couple of additional steps sawing and chiseling to fit, the notch after paring smooth. Hold the brace in its notch and drill a 3/8" hole. Angle the hole at a right angle to the brace. 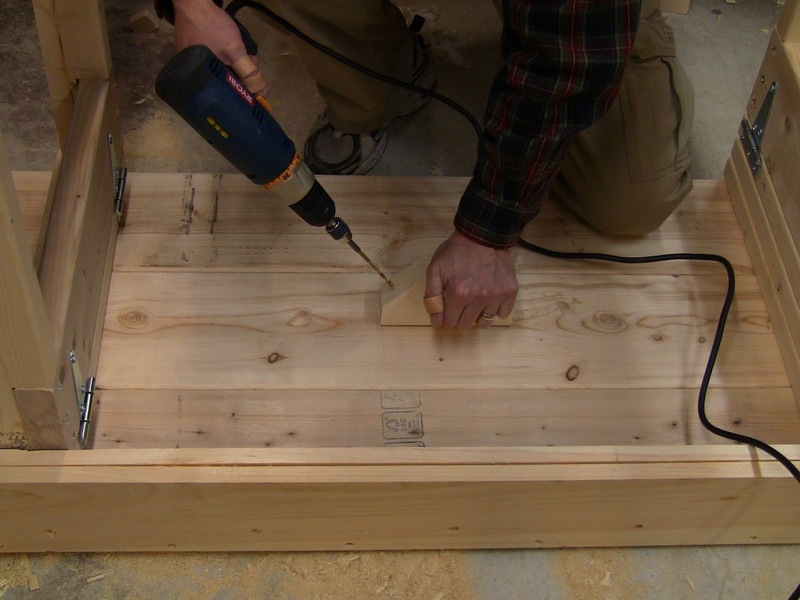 You may need to make a shallow starter hole straight into the stretcher first to keep the drill bit in place. Finish drilling through the brace. 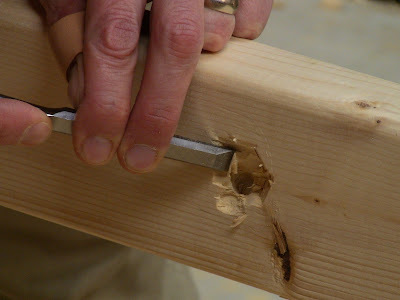 Chisel around one half of the hole in the stretcher so the head of the bolt will sit down in it. This one came out pretty ugly! If you want to notch the braces as shown in the original drawing, the procedure is the opposite. That is, you'll attach the braces to the stretchers first, then attach them to the pivot block. The issue here is getting the angle of the notch cuts right, or at least reasonably close. Minor changes in position as you are putting things in place will change the angles. But some gap in them doesn't really hurt anything. If you want to do it that way, clamp the ends of the braces to the pivot block and see where they contact the stretchers. Mark these points on the braces, then saw and chisel notches shaped as shown in the drawing. 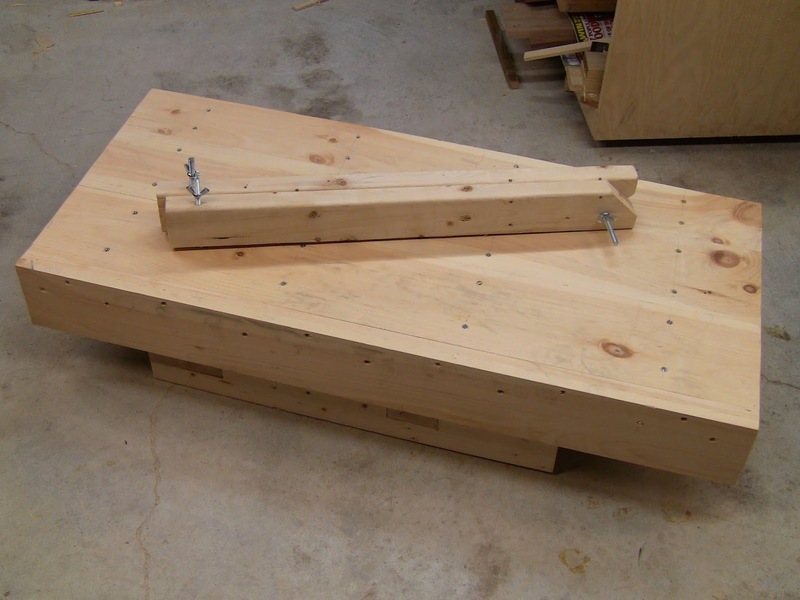 Drill holes through the stretchers and braces and bolt them in place. Finally, drill the hole through the other ends of the stretchers and pivot block and bolt them in place. Either way should result in a rigid assembly. The braces bolted secure and rigid. Closeup of the brace in its notch and bolted in place. Now that you know exactly how long the braces are, you can saw off any excess at the stretcher end, leaving about 2" of the end past the bolt holes. 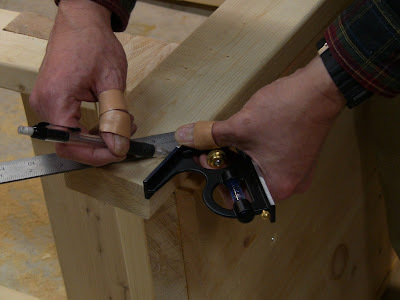 Use a chisel to pare off a small chamfer along the edges where you ripped the legs to width. This will help avoid splinters. Mark a line 1/4" in from each end across the top and along the front apron. Saw this off to flush up the ends of the top even. Chamfer the sawn edges of the top lightly with a chisel. Trim the brace end 2" from the bolt hole. 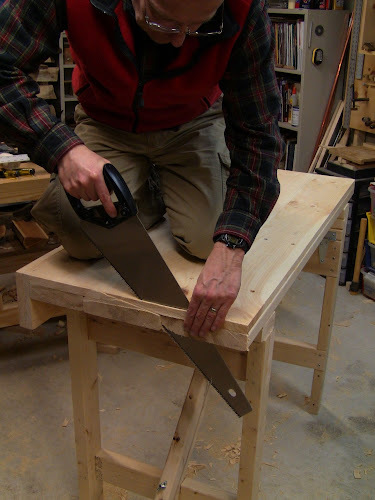 With a paring action, lightly chamfer the sawn edges of the legs. After marking a line across the top and front apron, saw off the ragged ends to flush everything up. Lightly chamfer all the cut ends. 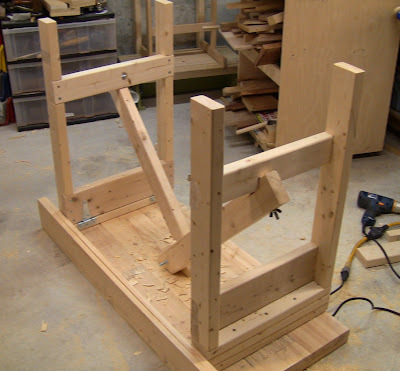 The very last step is to disassemble and fold the bench and install gate hooks to latch the legs in place when they're folded. The first few times you may have trouble getting the bolts in and out, but after a few cycles of disassembly and reassembly, the holes will wear enough to make it easy. Drive stuck bolts out with the mallet and another bolt or screw against the end. The bench is done! There's still the vise to attach, and you need to deal with getting the four legs to sit flat on any surface. But the construction is complete. This is what you get when you use lumber straight from the home center without jointing the edges. The pieces for the top may have looked straight, but there are gaps where they meet edge-to-edge. Ugly, but it won't affect the performance of the bench. The assembled bench up on its feet. For the moment, don't worry if it doesn't rest perfectly flat on the floor. Bottom view all folded up. Note the gate hooks holding the folded legs in place. Top front view folded up. 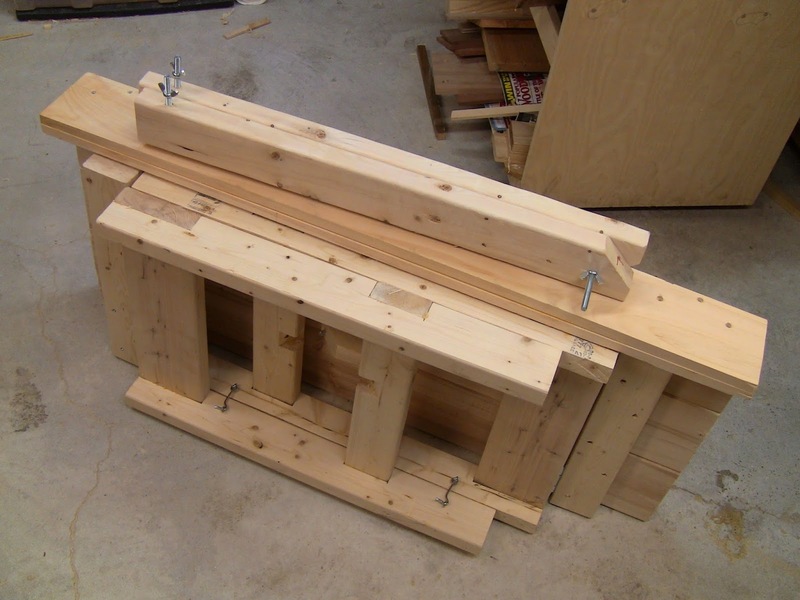 In part 5, we'll mount the vise. Very nice design, Steve. It looks very well thought out. Hope you're well, friend. Thanks, Joshua! Yes, doing well, hope you are too. 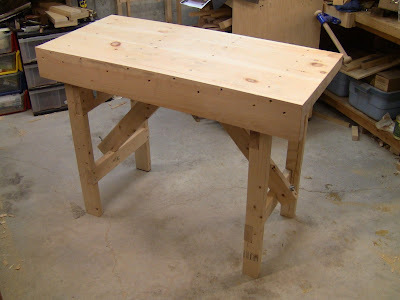 Hey Steve, I just completed my Apartment Workbench following your instructions! While I'm not new to working with wood, I am new to using hand tools and the like and found your instruction to be very precise and helpful. Are you planning to update with the vise attachment soon? I would love some more of your expertise before I go ahead with it. Thanks again for the time and money you put into this! That's awesome, thank you so much! Yes, I've completed the shop work for the next part, I hope to have it posted sometime this week.